The crowds watch a street performer – or is that the box office queue? UPDATE: For anyone who’s come to this page via a search engine or an old link, this article has been updated for 2014, and you can find it here. If, for some reason, you want to see the old version – you never know, maybe you want to know what I used to write about the comedy festival – I have kept the old version for posterity. Right then. My Buxton Fringe Survival Guide only got a trickle of the traffic compared to my Brighton Fringe Survival Guide, but, what the hell, I may as well finish off this series. 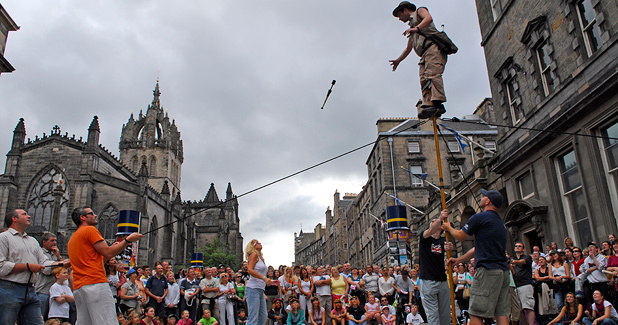 Here is my guide for how to make the most of the Edinburgh Fringe as a punter. This will be a little different from my last two articles. Before, I was writing guides for people used to the Edinburgh Fringe on how to make the most of Brighton or Buxton. This time, however, it makes sense to write tips aimed at someone who’s never done a fringe before. The other difference is that whilst I’ve never seen anyone else do a guide for Brighton or Buxton, loads of people do guides for the Edinburgh Fringe. Therefore, rather than attempt to do a comprehensive guide to everything there is to know, this is mostly a list of things I wish I’d known when I first went. Some tips are widely-held opinions, others might be more controversial. Michael Chaplain’s Tyne may be popular locally but won’t have life outside of Tyneside. However, the hard work that went into this is an example for everyone else to follow. This is one of the few plays I see where I’m not really in a position to say whether it’s any good. Tyne, Live’s contribution to the festival of the North East, is clearly aimed at the people of Tyneside, packed with stories and memories that the people of Tyneside identified with. It certainly was a box office success – almost every performance sold out – but those who’ve followed this blog will know how suspicious I am of local writing. Maybe my cynicism has been entrenched from years of the Gala Theatre’s “local” productions that weren’t even local (Durham council please take note: the people of Durham city do NOT consider themselves a suburb of Newcastle), but I’ve been very disillusioned by how formulaic a “local” play can be and still get bums on seats. The typical mediocre “local” play tends to have a very basic plot that could have been acted in 30 minutes rather than the two hours, and the rest of the time is spent talking about local references. And, worse, it always seems to be the same lazy predictable things referenced in play after play. Well, this point of laziness is what separates Tyne from all these mediocre scripts. This play is essentially a collage of numerous stories, real and fictitious, past and present, from the banks of the Tyne. Some of the stories are passages from past local plays at Live, but much of it is local legends and even stories of ordinary people who the writer talked to. Most of these stories were things I’d never heard of, and the amount of work Michael Chaplin must have done is admirable. Thank God for a play that recognises there’s more that defines Tyneside than St. James’s Park and the Angel of the North. Yes, it’s that time of year. Just when fringe addicts have got used to the idea that a festival fringe involves a nice relaxing morning and maybe a play or two after four, it’s the big one again. No pussyfooting around at this one, and anybody who sees less than four plays on their first full days is officially a wuss. This is going to be mostly a list of plays I’ve previously seen at Brighton or Buxton this year, but there is the odd exception. So, this time round I think I’ll mention things in the order I first heard of them. So the long-standing recommendation is The Big Bite-Size Breakfast and ten-minutes plays. As always, there are three different sets of ten-minute plays in rotation, at Pleasance Dome at 10.30 a.m.. The exact line-ups haven’t been announced yet, but I understand there’s not going to be any specially themed sets like they did last year with “Vintage”. (Well, they do have themes, but normally the themes are vague and open-ended enough to mean anything you like.) To those of you who saw them last year, this might look like they’re playing it safe and going into their comfort zone, but at this year’s Brighton Fringe I saw some new plays that were very risky but actually very good. It’s worth seeing all three of these if you can, but if you only have time for one, make it Menu 1 if you’ve not seen them before (where they are re-showing some tried and tested plays), or Menu 3 if they have (which has some good new plays in them). Buxton Fringe is still going, but my participation finished last weekend, both as performer and punter. I have a few things to write about, but the first one is my usual roundup. This is harder to do when you’re working alongside other performers and counting on mutual support, but I’ll give it a go anyway. If you asked me for a favourite out of what I saw, there is one clear winner: Jordan from Stickleback Theatre, written by Anna Reynolds with Moria Buffini. This play, written in 1992, tells the tragic but true tale of Shirley Jones, driven to kill her 13-month-old son by the actions of an abusive partner. This is a one-woman show interwoven with the story of Rumplestiltskin, another tale where a mother faces her baby being taken away by a man up to no good. COMMENT: Open-access arts festivals are now commonplace across southern England. The north-east is missing out. Those of you who are following my blog will know that this time, after several years of thinking about taking something to a fringe festival, I have finally decided to go ahead and do it. Tomorrow, I set off for Buxton. I chose Buxton over Brighton or Edinburgh because it’s a good balance for a fringe newbie. It’s not big enough that you have to engage in a manic publicity/leafleting campaign to get an audience, but it is still high-profile enough to have a serious crack at increasing your exposure. At the moment, I don’t know how this will turn out, but it’s an exciting experience, I can understand why so many people want to do this. But, the thing is, much as Buxton is a lovely place for a festival fringe, Buxton isn’t my first choice destination. And no, my first choice isn’t Edinburgh or Brighton. What I would really like to do is showcase my work in the north-east to a local festival fringe audience. I can’t do this, because they don’t exist. I have a number of problems over lack of support and opportunities for theatre makers doing work off their backs, but this is problem specifically faced by northerners. Why? Because in the south of England, you are spoilt for choice. If the Brighton Fringe isn’t close enough for you, there’s Oxford, Bedford, Bath, Reading, Barnstaple, Windsor, Camden, and Ipswich on offer. Okay, with some of these aren’t fully open-access festivals, and therefore their claim to be a proper fringe is questionable, but how does this compare with the north? Not a lot. Buxton is in reach of Manchester, there’s a couple of low-key attempts with the Greater Manchester Fringe and the Nowt Part of Festival (a kind of unauthorised fringe to the Manchester International Festival), but for everyone else in the north: nothing.